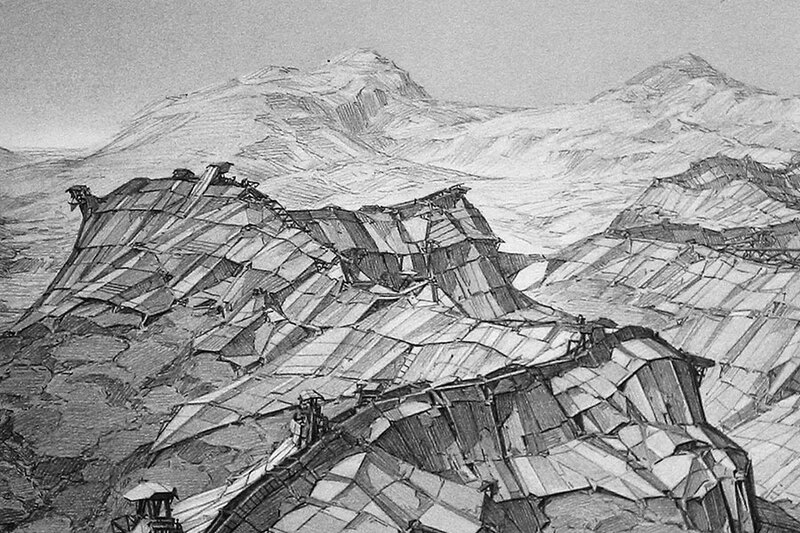 Lebbeus Woods’s period of greatest notoriety coincided more or less with my student years. His extraordinary drawings were much admired and often copied; his concepts of open-ended and parasitic structures were hugely influential. I attended the Bartlett School of Architecture during the Peter Cook years, when Woods was a frequent visitor and something of a guru. All of which is to describe a landscape in which Woods figured prominently, although it wasn’t one in which I particularly participated. I was heading in a different direction and it wasn’t until I came across his blog, begun in 2007, that I developed a more personal appreciation of his work. The first thing that struck me then was that he was writing a blog at all. For someone of his stature it seemed a remarkably generous gesture. It was words written for free for anyone to read, uncommissioned, and put out in the world without much fanfare or pretense. It helped that it was a genuinely exciting period for architecture blogs, lots of new voices eager to take part in a free-flowing and dynamic conversation. Blogs democratized architectural criticism. Suddenly, you didn’t need an editor or a commission from a magazine to be a critic. Nor did you need to spend time making a fanzine and finding a way of distributing it as previous generations of ambitious young architects and writers had done. Instant global access was possible and the words stood on their own merits. A number of interesting young writers, many of them now established authors, built their careers from blogging. Left to right: City of Fire, 1981; Aerial Paris, 1989. Aeroliving Labs: an imagined “community of heavier-than-air structures over Paris”; High Houses, from War and Architecture, 1993. But Woods was none of these things and he didn’t need to write a blog to be heard or to get attention, So there seemed to me a special kind of open-mindedness to his writing one, including his willingness to engage with readers’ comments, not all of them positive. But beyond the interest of an established architect engaging with a medium that tended to disrespect its elders, what was Woods’s blog about? Was it an offshoot of his design work or a separate branch of criticism? In his perceptive introduction to Slow Manifesto, Christopher Hawthorne discerns a conservative strand to Woods’s writing that was somewhat at odds with the drawn work. Woods’s tone was measured, ruminative, almost scholarly. He wrote about a wide variety of topics: The Bosnian War and the siege of Sarajevo figure heavily as Woods proposed a number of projects relating to the conflict. He also wrote about drawing—at which he was exceptional—and the work of other architects that he admired. And he pondered the point of speculative and experimental work. Some of his thoughts on architectural education—particularly on collaborative and “analogical” design studios—still offer important alternatives to the cult of individual genius that presides in most schools today. But mostly, Woods’s blog was the product of a mind that was preoccupied with architecture, a necessary outlet for thoughts that couldn’t always be expressed through drawing or teaching. The words seem to come after the work as attempts to frame and explain its preoccupations, but there is a speculative quality to the writing too. It is neither criticism nor justification, but another way of thinking about the same issues. Blogs usually have no clear end point. They tend to drift away with ever more sporadic posting. The apologetic “It’s been a while since I last posted” entry is one familiar to most bloggers. There comes a time when they cease to be fun or useful or when other things take over. And to a large extent their time-consuming, mini-essay format was rendered obsolete by Twitter’s breezy, instantaneous chatter. Lebbeus Woods’s blog came to a more sudden end. His last post—“Goodbye (sort of)”—is still there at the top of his homepage, a lingering and moving elegy. This book brings together a selection of the posts that preceded it, minus the readers’ comments that formed such an essential part of blogging. Published together they read as a conventional if randomly organized collection of short essays. But something has been lost too, not least the immediacy of someone’s thoughts popping up every other day or so: a real-time transcription of the ideas preoccupying them. That sadly is no longer possible. So we have Slow Manifesto, which serves as a record of a remarkable mind, still thinking, still moving through ideas until the end.